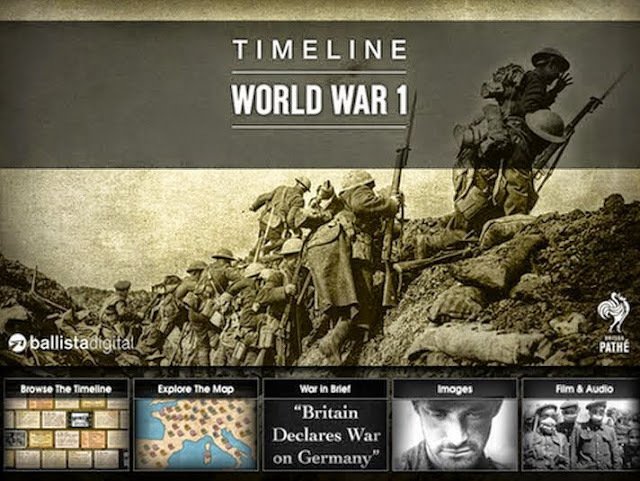 Is an App on WW1 better than an eBook and better than a book? May 19, 2015 8:14 am / 1 Comment on Is an App on WW1 better than an eBook and better than a book? This is a fascinating insight into the way we learn and educate is changing with students exploring, creating and sharing from an App ‘smôrgasbord’ of rich, interactive content. This conversation will keep me busy for several months. The debate on the guardian site is heated, personal and too often Luddite in tone. Why try to say that a book is better than an eBook is better than an App that is ‘book-like?’ I’ll be pitching in as I believe what he argues is right and applies immediately to Geography too. I‘ve studied online learning, history and geography – all to Masters level. I’m not an historian, geographer or an educator: I’m simply deeply curious and fascinated by the way we learn. Key to Apps is immediacy, relevancy and motivation. Put content into a student’s hands in a way they appreciate: at their fingertips, multi-sensory and connected. An App can take all that is a book, and add several books and angles; all that is TV or Radio and have the person sit up, create content of their own, form views, share opinions and therefore learn, develop and remember. I then read around the subject and often go back to the sources the author used and eventually form my own opinion. These days I will share it online and have it shot down or applauded – or both. In due course I read more and adjust my original perspective which is fluid. The origins of the First World War, Haig and Passchendaele are points of interest – also all factual and fictional interpretations on TV … and RFC/RAF flight training (because that was part of my grandfather’s story). Constructing a length piece of writing – over 50,000 words and need to stick to the chronology of events, at least in the first draft, I have found using the timeline creation tool Tiki-Toki invaluable. You can create one of these for FREE. Over the last few months I’ve been adding ‘episodes’ to a timeline that stretches between 1914 and 1919. You get various views, including the traditional timeline of events stretched along an unfurling panorama. However, if you want to work with two screen side by side the 3D view allows you to scroll back and forth through the timeline within the modest confines of its window. 1) It is a gripping piece of entertainment that incorporates modern music to help evoke the feelings and tone. 5) You too will be recommending that people watch it. 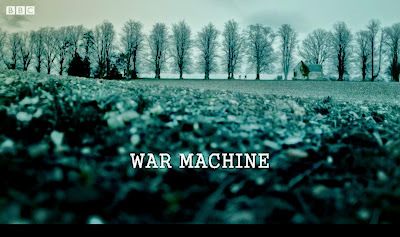 6) The series so far is excellent, this episode stands out as brilliant – I was left weeping in sadness and joy, while reflecting the violent conflict, though not on this scale, is still very much a contemporary issue. How many years has it taken me to realise that results are the product of the effort you put in, that being a ‘jobsworth’ is counter productive when it comes to studying. You may tick the boxes, but if you know you haven’t got your head around a thing then you know soon enough where you grades will fall. I can be honest and proud of what I know I can achieve now having recovered from marks at times that got close to ‘fail’. I now know why I fail at the opposite end, falling a few marks short of a distinction. It is down to persistence and effort right at the end. Reaching such heights did I suffer from vertigo at the end? Do I go into self-destruct mode? Sometimes. Having ‘finished’ with a few days to spare I went off the boil, I even ‘celebrated’ what I felt was more than good enough. But I held back from the ultimate test – reading out the essay, recording this and then listening back as objectively as I could. Rather, I ‘looked through it’ and noticed the odd glitch and one need for a reference and then a loose thread, a knot badly tied – that would need take time and effort. Like spotting a mistake in a tapestry once it is finished and knowing that the only answer is to flip the think over, carefully cut out the offending threads, then with huge care stitch in something that would fit better. Rather than doing this, having mentally ‘put the thing in the post’ I went out. Coming home that evening I very nearly forget even to submit the thing before the 12.00 midnight deadline. Two marks short of a distinction. Of course, I should be adequately satisfied with the result. I’m not because seeing what the examiners picked up I can only curse, as a few simple fixes – a sentence that wasn’t a sentence, a turn of phrase that made sense to me but no one else … a reference that was blatantly missing that could so easily have been added as I’d already cited the book often. These might have added 1 1/2 marks … then, to have stayed home, unpicked and re-written a thought THAT would have added 3 to 5 marks. So, if the personal satisfaction of achieving a distinction remains illusive I have only myself to blame. The issue of course is that any and all writing I may do if it doesn’t seek to attain, and attain such a standard will continue to be the differentiation between a student and ‘scholar’, an amateur and an academic, a wannabe author and someone who is published or produced. On the one hand I ‘suffer’ as a perfectionist, on the other I hold back from committing and sticking to a goal. I use the artist’s excuse that you can overdraw, overpaint and add too much and destroy a thing. This isn’t the case with writing. It may spoil the fun of constructing a piece of writing by putting yourself through the pain, but it is the mental pain, and therefore the time and effort, that is required at this level. In 1964 the script on the Great War could have been written a hundred years before … especially the ‘gay hussars’. But a male script for a male audience. Her and her .. sides against each other. Interviews anything but … without exception they appear to have learnt set lines or be reading from a script, so lacking authenticity. Removed from the front line, so much so that we could be describing an international chess tournament. 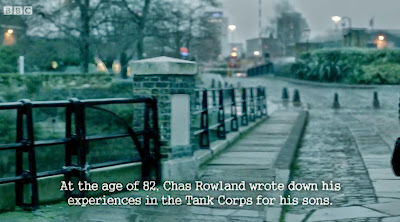 IN 1964 tens of thousands of veterans were still alive. In 2013 there are of course none. So the very choice of words grossly conditions the feelings we are supposed to have. Better then to have the celebrity historian to take us through. Then a female ‘interview’ and in 45 seconds she rambles through lines that have so clearly been pre-written, or learned because they are so word perfect. 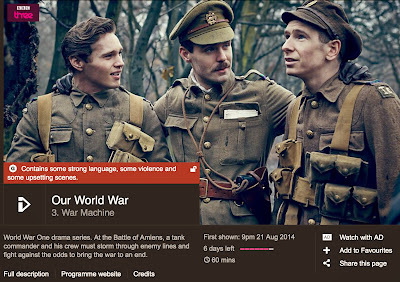 Fifty years on from the BBC’s ‘The Great War’ the immediate issue is the choice of voice overs – the choice of the grandest. most pompous and celebrated voices of the age is a statement. We have ‘Sir Ralph Richardson’ doing the voice of ‘Douglas Haig’ – who was, or had been, Field Marshall Sir Douglas Haig. So our ‘ACTORS’ felt themselves better than our leaders in the Great War? The tone and construction is of its time … which is more 1954 or earlier. It sounds so archaic. All voices are male and old. All voices are voices – not their view, opinion or research, but reading words they have been given by the experts – in this case more male historians managed by male producers. There is a distinct male tone. It was, from this perspective, an utterly male world. What happens when connected as ‘like-minds’ six or seven such individuals ‘collaborate’ to perform some atrocity? Society online is a society on speed and at speed – it might reflect society but in the Alice in Wonderland World Wide Web everything is faster, connectable and so warped in a way that transcends human scales of time, distance and decency. One sick, warped, isolated individual seeking out the pollution of the web to feed their fantasy and make it real, like Anders Behring Breivik in Norway in 2011 was, if you profile the population, 1 in 10 million. What indeed does the web afford ‘networked’ terrorist idealists such as AL Qaeda? Attending a seminar on cyber crime at the Oxford Internet Institute last year it was revealing and shocking to learn of the ‘game of catch-up’ played between the criminals hacking bank accounts and the banks trying to keep them secure. 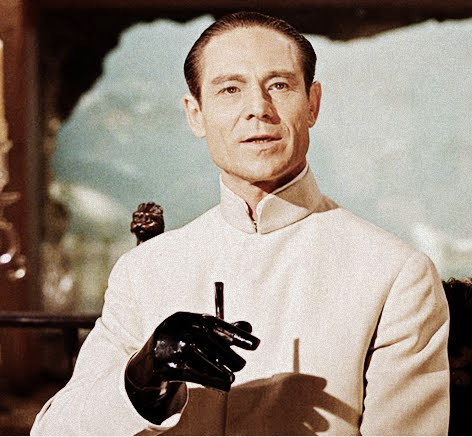 The head of internet security from Barclays painted a picture that would make the scriptwriters of a James Bond movie go googled-eyed in amazement. Then, far from society creating the Web, the web world infects us ‘on the other side’ with paranoia and so CHANGES behaviour, gets AHEAD of society. It has happened to me more than once – in the early days of blogging back in 2002 I was ‘flamed’ viciously (malicious hate in comments and a breach into my blog that had this person editing my content and filling it with bile). I had this stopped and attempts were made to trace the character but for a period I was convinced that any vehicle pulling up along our street outside our house was ‘him’ … and then this summer I put webcams around the house when we went away from a few weeks and only after the first week did I relax when I noticed that a brick hadn’t come through the window and we hadn’t been burgled or the house burned down. (I write this while reflecting on the words of Professor Susan Halford in the Week 3 introductory video on cyber crime that forms part of the University of Southampton‘s Future Learn offering ‘Web Science‘).